Sydney-based architects Koichi Takada have a reputation for using timber to create calm and graceful interior spaces. 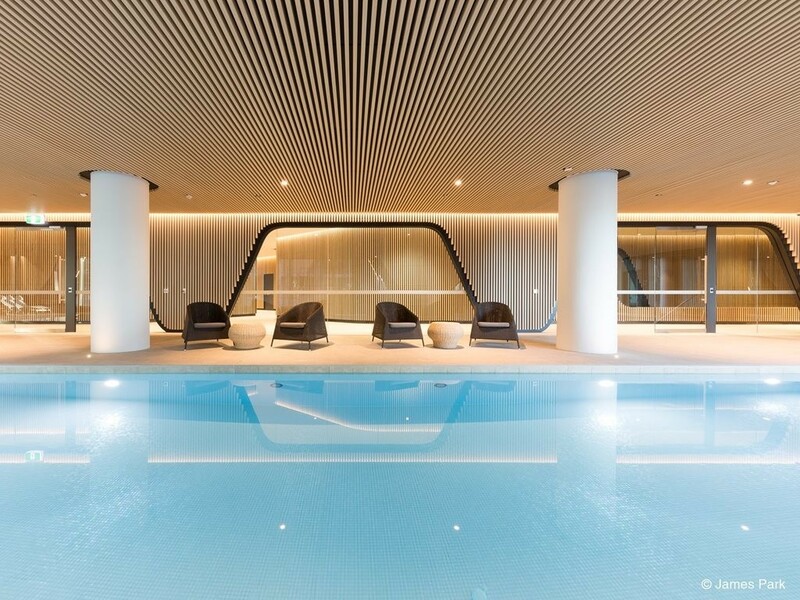 When asked to design the communal pool area within a luxury apartment project in the inner-Melbourne suburb of Docklands, Koichi Takada needed to specify a material that was appropriate for the setting. As pool settings have such high humidity, using timber was not practical – wood would have warped over time, adding refurbishment costs to the project later down the track. Not wanting to stray from their signature aesthetic of warm timber, Koichi Takada’s design team chose instead to use Covet’s Japanese-made Ever Art Wood® batten cladding – a high-quality, lightweight aluminium product with a photorealistic timber finish. With a versatile 30x50 two-section profile, the Kabebari system was easily installed on the ceilings and walls of the pool area. The ‘male’ section was screwed to the ceiling, where the ‘female’ section could easily be slotted in place over the top, allowing evidence of screws to be hidden. The result is a series of perfect lines and detailing around the area’s sloped walls and columns; a space that is engaging and visually diverse. Where other wood-look timber products can have an unrealistic sheen, the Ever Art Wood® series demonstrates a realistic matte timber finish that ensures a natural aesthetic for architectural projects. Practically maintenance-free and dimensionally accurate, the Kabebari system also performs well when tested to AS/NZ 1530.0 and AS/NZ 3837-1998.